Corn Gluten Meal | Gardens Alive! I was ready to use corn gluten meal on my stone front yard in the spring, but it's already teeming with small plants; they look like green confetti on my stones. Can I use corn gluten anyway, or must I suffer through another year of spraying vinegar on the weeds? I heard about the wonders of corn gluten meal and ordered some. Then we decided to turn our lawn into a garden. But we have a big problem with crab grass in that garden. Can we use the gluten there? Or is it only for lawns? Does corn gluten meal alter the pH of soil? A local county agent told me it would, "and then I would really have problems"! I didn't really believe him; these agents don't even want to talk about"organics". I was able to get a local feed store to order me some at a very low cost—less then $20 for 50 lbs. 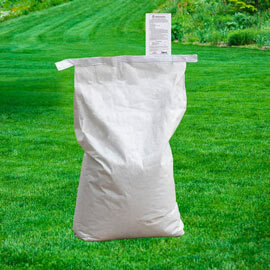 Is corn gluten meal okay to use on our zoysia grass lawn? I've been applying gluten in the Spring and Fall. We used a name brand product the first year, but since then we've been using stuff we got at the local feed store (it costs a lot less!) But the gluten doesn't seem to be working now; we have so many weeds! Mike: Our Master Gardener program was hoping to use corn gluten to stop weed seeds, but it looks like the quantities we'd need would be very expensive. A cheaper type is sold by local farm stores in the form of pellets; one place ground some up for us, but it didn't seem to have much effect on pre-emerging weeds. Is there a difference between these pellets and the products at garden supply stores? There are an awful lot of misconceptions about how corn gluten meal works. As turf grass expert Dr. Nick Christians discovered at Iowa State University, corn gluten meal—a by-product of cornstarch manufacture—has the ability to prevent successful germination of weed seeds—and pretty much all other seeds too. I generally just say "all seeds" so that people realize they shouldn't sow grass or veggie or flower seeds when they use corn gluten meal, but Dr. Christians, being a researcher, would like to note here that a few seeds (barnyard grass and velvet leaf specifically) don't seem to have been affected in lab studies until large amounts of corn gluten were used, and even then it didn't reduce their germination rate as much as the other weeds tested. In a lawn and garden situation, however, keep thinking "all seeds" to be safe. And, as we'll explain in a minute, even weeds whose seeds aren't strongly affected can be knocked out of a lawn over time with continued use. Back to the basics for now: Corn gluten meal is also naturally high in nitrogen—the food lawns crave the most. 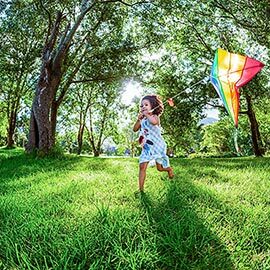 This makes it a perfect substitute for the toxic chemical "weed and feed" so many homeowners use to the detriment of their health—and the health of their family, pets, water, and the planet in general. Apply the minimum of 10 pounds per 1,000 sq. feet of lawn and you're providing a pound of nitrogen; move up to the weed-killing max of 20 pounds per 1,000 sq feet and you're giving your lawn two pounds of 'N'—an absolutely fabulous natural feeding. But established perennial ("broad leaf") weeds in lawns are a more interesting story; regular applications of corn gluten meal do control them. The gluten prevents dropped seeds from sprouting new plants, and it feeds the lawn so well and naturally that if you cut your grass correctly (see previous lawn care Questions of the Week; links below), perennial weeds like dandelions will be crowded out by the roots of your now-happy grass. Corn gluten does not change soil pH or harm any type of grass or existing plant (other than eventually crowding out established weeds in lawns). It won't hurt your zoysia grass, tomatoes, Springbulbs, etc. etc. So yes, go right ahead and use it in the Spring to prevent dormant weed seeds from sprouting in flower and vegetable beds—especially after tilling and other forms of soil-turning that uncover a lot of buried weed seeds. This type of use has proven to be a wonderful method of weed control in strawberry beds, to name just one well-researched example. Just remember that no seeds will sprout there for six weeks, so use another form of weed-control in spots where you'll be planting by seed, and save the CGM for where plants are going in. Labeling: "Corn gluten meal" sold as animal feed is not the same thing. It is not licensed by Iowa State, so the university is not compensated when you buy it; and it often does not contain the right protein concentration to achieve seed death. I have received many emails from listeners who thought they were getting a huge break on the price, only to discover they were simply feeding their emerging crabgrass. Products licensed by Iowa State will say something like "pre-emergent herbicide" on the label, have the correct protein concentration, and carry complete instructions for proper use. They are more expensive than animal feed CGM because they use a much higher quality gluten—which sells at a premium—and the manufacturer pays that fee to the university to fund research to find more cool stuff like this. Bylaw, animal feed gluten cannot say anything about herbicidal effects and will not have directions for any weed-killing use. It also might not work—did I mention that?